Give Chicks A Non-GMO Feed That They Like To Eat. Our chick starter feed is ground finer for easy consumption. We can adjust the grind to the right coarseness and texture to suit your poultry. Our chick starter feed contains higher protein for a better start. You can smell the freshness and see the quality in our feed. Assist your chicks in their healthy, natural eating habits with chick starter that is appealing and easy to digest. We also carry non-GMO soy-free chick starter feed for special diets. Our feed contains no added hormones, no antibiotics, and no medications. 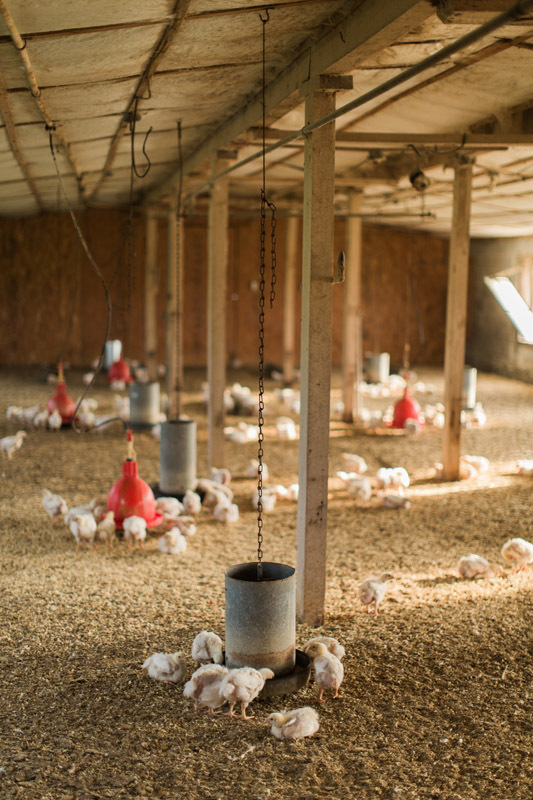 Customize Our Non-GMO Chick Starter Feed To Your Flock’s Needs. At Sunrise Farms we grow our own layer and broiler flocks. We understand that the right feed sets the foundation for the life and products of the flock. We have regular recipes for building fortitude and health in chicks, but are also able to accommodate custom feed blends with our on-site mill. We use Fertrell mineral for our non-GMO feed. Purchase our proven non-GMO chick starter feed or customize your non-GMO feed with Sunrise Farms.. For custom orders, we require a minimum order of 500lbs. or 10 bags with a nominal fee. Easily Purchase Our Non-GMO Chick Starter Feed. Our non-GMO feed is sold at select dealers. Just look for the Sunrise Farms label to know you are in good hands. Call ahead to order your non-GMO feed in all quantities and we will prepare it for you to pick up at our storefront. We offer regional feed delivery and feed shipping throughout the contiguous United States. Feed is sold in 50lb./22.68kg bags and by the ton. From Our Virginia Farm, We Provide Expert Non-GMO Feed Blends Across The United States. For the non-GMO farmer, we are your chick starter feed supplier. We maintain competitive prices with careful stewardship of our resources. To formulate the ideal chick starter feed blends, we may procure ingredients that are not local to our area such as field peas and oats. We do the work to develop the right chick starter for your flock. For local buyers, we offer storefront pick up, have dealers located throughout the eastern states, and provide regional feed delivery. We offer feed shipping to the contiguous United States. Feed Free Choice To Broiler Chicks For First 2-3 Weeks As A Complete Ration. Provide Fresh Water, Fresh Air, And Dry Bedding. Corn, Roasted Soybeans, Oats, Calcium Carbonate, Fish Meal, Calcium Carbonate, DiCalcium Phosphate, Dehydrated Seaweed Meal, Salt, Sodium Selenite, Vitamins A, D3, and E Supplements, DL Methionine, Choline Chloride, Menadione Sodium Bi-Sulfite Complex, d-Pantothenic Acid, Niacin, Riboflavin, Pyridoxine, Thiamin, Vitamin B12, Biontin, Folic Acid, Polysaccharide Complexes of Iron, Manganese, Zinc, Copper and Cobalt, Yeast Culture, Lactobacillus Acidophilus Fermentation Product, Bacillus Lichenformis, Bacillus Subtilus, Lactobacillus Lactis, Streptococcus Faecium, Protease Enzyme (dried Aspergillus Oryzae Fermentation Extract). Contact Us For Non-GMO Chick Starter Feed Today.